Focale 44 is a fixed/commuter bike brand from BMX Groupment, an Andorra-based company that – you guessed it – specialises in BMX. This is the third year of producing fixie bikes, and there's a range of models, which seem to all be built around the same basic frame. This test bike is the Focale 44 Relax, a flat-barred commuter bike that the company places in the middle of its range. First impressions are that it's quite smart. The matte-black paint job is good, and, whether you like or loathe white tyres (I'm not a fan), they're not too garish. Overall, it's an understated package. The integrated bar and stem – rather like the original Specialized Globe Rolls – is also an interesting touch. The standard gearing is 42/16, a decent go-anywhere gear for negotiating traffic and gentle hills, and fine for rolling around London. The wheel has a double fixed flip-flop hub, so you could run another cog on the other side if you wanted a choice of gears. Thumbs up, more or less, for the looks then; and the ride, too, is pretty good. Being a fairly heavy package, it's not the fastest bike on the block, and it's not going to win any prizes for power transfer or stiffness. That's not really what it's about though: it rides well enough on the commute, and clips along once you get it going. The tight, track bike-inspired geometry means it feels nippy, despite these disadvantages. It tracks dependably through the corners, though the fairly upright position and wide bars meant that I took it a bit easier when weaving through traffic than I would have on my own bike. There's a lot of toe overlap too, another reason for caution. They were also hands down the most obstinate tyres I've ever had to manhandle on and off a wheel. 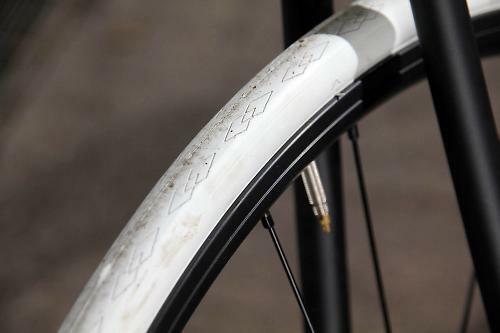 Add to this a narrow rim, with a deep, bevelled (almost sharp) internal profile, which leaves little room for the inner tube to sit, and you've got a big headache when fixing punctures. One last wheel gripe: the front wheel went significantly out of true during the test period. That's partly the fault of London's roads, but all in all the wheels didn't seem very robustly built. Where next? Oh yes, the brake. The lever was fine, but the calliper was incredibly flexible, resulting in very spongey braking. Also, the quick-release lever did not actually loosen the callipers, or at least the finest minds in the Road.cc office couldn't make it work. 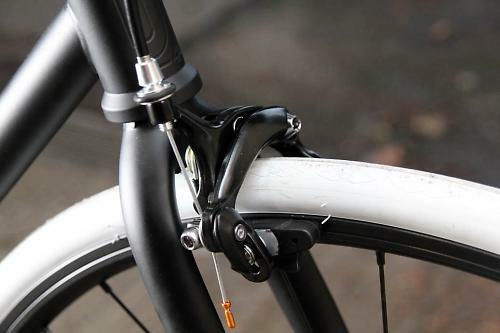 It's a real let-down, and given there's only one brake – standard fixie issue – a pretty poor show. To give it its due, it did stop pretty well, though there was a fair bit of shudder in the wet. The pedals, too, seem cheap. I liked the fixed-freestyle velcro straps, but the plastic pedals angled away from your foot as they came around, making it difficult to get securely in, and with the fixed gear you only get one chance per revolution. In all, then, the components felt like a bit of a letdown. The bike seems to have a list price of £559, which is a good whack of cash. Given you can get a basic race bike or an entry-level hybrid for significantly less than that – with multiple gears, two brakes etc – it's disappointing to get so little for so much. 4130 Cro-Mo steel, frame and fork both. TIG welded. Available in 49cm, 52 cm, 55 cm, 58 cm sizes. * frame : higher BB position (+ 5 mm), thinner seatstays, thicker dropouts (5 mm), bigger tire clearance, up to 35c. 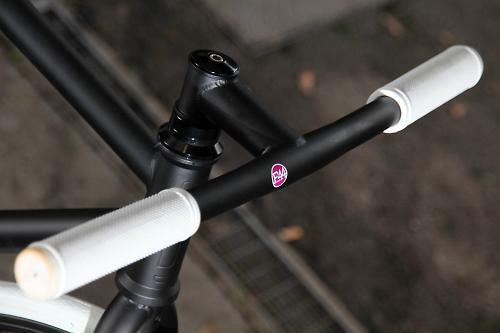 * bar/stem combo : shorter stem (75 mm). * rear hub : dual-threads for fixed cog both sides. 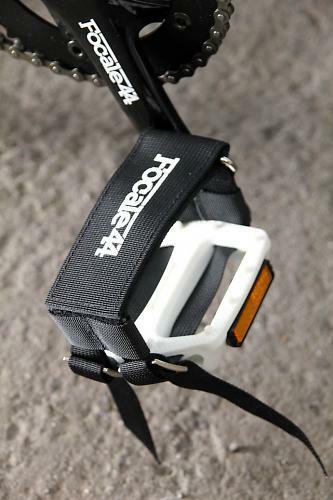 Every Focale 44 bike is delivered with brakes, freewheel and fixed sprocket. Both frame and fork are sturdy and well finished, though the fork's styling could charitably be called 'utilitarian'. The welds are quite neat, and the matte-black paint is pretty smart. 4130 Cro-Mo says the site, and a straight-blade fork. All in all, it's not a light package, but it's what you'd expect from a bike at the cheaper end of the price spectrum. Amazingly, £559 is fairly cheap for an off the peg fixed-wheel these days. Pretty tight and track-bikey. Means it's nippy, but the toe overlap is fairly epic. Good. The company have apparently shortened the stem for 2012, so the position was fairly upright. Yes, it was pretty comfy. The stock saddle was pretty good, though a little spongier than most. It was passable. But compare it to a frame built with decent steel, and a nice pair of wheels, and it was soon found wanting. Not particularly. I suspect the lively-ish ride is more down to the tight geometry than any stiffness qualities inherent in the frame. I have another track bike that usually takes commuting duties, and it feels a lot more responsive to power, without any toe overlap. Epic. But it's a "track" bike, so that's the style. How would you describe the steering? Was it lively, neutral or unresponsive? It was quite precise, but let down by the tyres, which did not inspire confidence. Once you get it going, it pootles along quite nicely. A bit crappy through tight spots in traffic. You sort of worry about toe clearance. Seemed like a fairly standard fixed-wheel drivetrain. The lockring wasn't well tightened on the test model we received. A bit disconcerting when applying foot pressure on the brake, as the cog slipped to and fro. We know you should check these things over, but many people wouldn't. The front, laced radially, quickly went out of true. The tyres are very hard, plasticky and a total pig to get on and off. They did not inspire cornering confidence. The tyres didn't wear at all, so hard were they. The wheels weren't really up to the London potholes - but not too many are. I would definitely swap the tyres. The wheels went out of true, though I wouldn't heap all the blame on them for that, that's London's roads too. The grips were abrasive. Aside from them, the only 'control' the bike had, really, was the front brake. The lever was fine, but the calliper was poor quality. Did you enjoy riding the bike? It was OK. A decent ride, no hassles. Would you consider buying the bike? No - it's poor value for what you get.